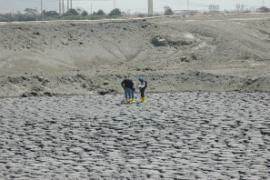 Above Picture: The end of the Oxnard Industrial drain after the completion of the grading and the installation of the coir matting during the Spring 2007 EPA Stabilization Action. 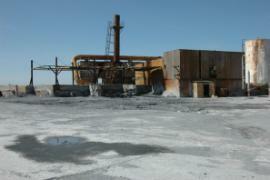 Halaco began operating a metal reclaiming facility on the 43-acre site located at 6200 Perkins Road, Oxnard, in 1965. 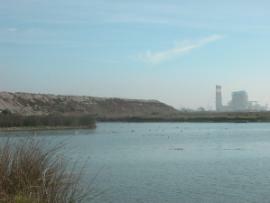 The Halaco facility is built on top of a historical open dump for the City of Oxnard. 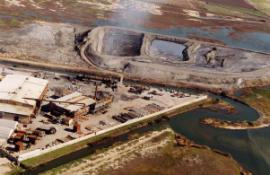 Prior to 1970, Halaco discharged wastewater into the OID and a small lagoon on the smelter property. The existing unlined earthen evaporation pond (WMU) was constructed in 1971. At some point, Halaco began depositing dried waste material on the area north of the WMU, a disputed 15-acre wetlands. The Halaco facility consists of two separate parcels on either side of the Oxnard Industrial Drain (OID). The smelter is located on 15 acres owned by Clarence, John, and Robert Haack and leased to Halaco, situated on the west side of the OID. The waste disposal area including the waste management unit (WMU) is located on 28 acres owned by Halaco, situated on the east side of the OID. The WMU was sold by the Bankruptcy Court and is currently owned by Alpha-Omega. For discussion purposes, the site is divided into the following areas. •	Smelter – where recycling operations commenced, on the west side of the OID. In July 1969, Halaco obtained a Radioactive Materials License to handle magnesium-thorium alloy in the form of scrap metal from the California Department of Health Services Radiologic Health Branch (RHB). The permit expired in August 1974 but was never formally terminated. Between 1965 and 1977, it was estimated that Halaco received and processed 500 to 600 pounds of magnesium thorium scrap per year. Historically, waste solids from the WMU were dredged up and deposited on the WMU berms. At some point, Halaco began depositing waste solids on the disputed 15-acre wetlands area to the north of the WMU. On June 9, 1977, the the U.S. Army Corp of Engineers (ACOE) served a Cease and Desist Order (CDO) to Halaco to stop dumping solid waste material into the wetlands area north of the WMU without a permit. This CDO was rescinded after a United States District Court ruled that the area was not a navigable water and therefore not under the ACOE jurisdiction. In early 1980, the USEPA issued Halaco an enforcement order under the Clean Water Act stating that the disposal site was a wetland and required a NPDES permit for operation. The USEPA obtained a preliminary injunction prohibiting further disposal to the 15 acre area north of the WMU. Also in 1980, the Los Angeles Regional Water Quality Control Board (LARWQCB) issued revised waste discharge requirements limiting waste discharge to the current disposal site. Numerous lawsuits ensued. In 2000, the City of Oxnard Fire Department served a search warrant for illegal disposal of oil into site process equipment, ultimately being discharged into the WMU. Also in 2000, ACOE informed the LARWQCB that the area east of the WMU, beyond Halaco’s property line, was a jurisdiction wetland. In June 2000, the LARWQCB estimated that 430,000 cubic yards of waste material were present in the WMU at thicknesses varying between 20 and 40 feet. In June 2000, ACOE staff informed the LARWQCB that the area east of Halaco’s surface impoundment was comprised of a substantial area of wetlands subject to ACOE jurisdiction. In September 2002, Halaco ceased discharging into the WMU in response to the LARWQCB’s March 2002 CDO No. R4-2002-0064 and began operating a filter press to process waste material. Sewer discharge ceased in June 2003 when the permit to discharge terminated and was not renewed. Pursuant to the March 2002 CDO, Halaco characterized site wastes to determine whether the solid waste was inert. Based on Halaco’s report, the LARWQCB determined that the solid waste was not inert due to elevated levels of ammonia that could be released to ground and surface waters. In July 2003, the LARWQCB issued a Notice of Violation for piles of filter cake improperly stored at the smelter side of the property. In October 2003, the LARWQCB issued Halaco Cleanup and Abatement Order R4-2003-0135 remove the filter cake (process waste solids). Halaco’s past waste disposal practices were cited as creating conditions of pollution that violated Order 80-58, which threatened pollution to Ormond Beach and wetlands, the OID, and the Oxnard Plain groundwater. In November 2003, the California Department of Health Services Radiologic Health Branch (DHS) issued an Order to Characterize Radioactive Materials at the site believing that residual levels of thorium and cesium are contained in the materials in the WMU, along the OID, and in the water transport system at the site. In late 2004, all Halaco process operations ceased. Employees were terminated and filter cake and baghouse dust was sent to La Paz Landfill in Arizona for disposal. In a letter dated June 6, 2005, Halaco informed the LARWQCB that they did not have the funds to complete the required site characterization. Halaco filed for Chapter 11 bankruptcy mid 2002 which was converted to a Chapter 7 Liquidation in January 2006. In June 2006, the Emergency Response Section and Site Assessment Section conducted a joint Integrated Assessment of the site. The final report is expected in mid to late December 2006. The Integrated Assessment report is located in the documents section of this web site. EPA entered into a Consent Agreement with the responsible parties in mid-2006 to remove all containerized hazardous substances from the smelter facility (exluding process solids), consolidation of all loose process solids in the smelter into one of the buildings, securing of the smelter and WMU and placement a sediment runoff control measures. The PRP removal was completed on February 7, 2007. The removal successfully removed all containerized hazardous substances. 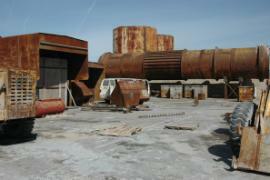 A large amount of process solids were removed from the yard of the smelter to inside the smelter building. There is approximately 5000 cubic yards of process solids stored at the smelter inside the smelter buildings, conex containers and quancet huts. 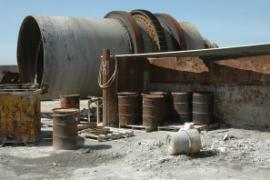 In February 2007, EPA Emergency Response Section began a stabilization action the Halaco site. The purpose of the stabilization action is to control contaminated runoff from the site, windborne erosion of contaminants and runoff erosion of sediments into the surrounding wetlands and OID. The stabilization action is expected to take 2 months. On March 2, 2007, EPA in cooperation with the City of Oxnard, closed access to Ormond Beach Wetlands from the Perkins Road foot bridge to the J Street drain. The closure was prompted by the discovery of elevated waste process solids in the wetlands just across the bridge. Sampling of these waste process solids documented elevated levels of alpha radiation. Removal of the thorium contaminated waste process solids was initiated during the week of March 12, 2007. The solids were transferred from the wetlands to the WMU via truck. EPA is working with the USFWS and the California Coastal Conservency to insure minimal impact to the wetlands or endangered species habitat. The cleanup of the wetlands was completed on March 23, 2007. Restoration of the wetlands is on-going. The area is expected to reopened sometime during the week of March 26, 2007. In late April 2007, the installation of the coir matting on the WMU was completed. A 6' fence topped with barbed wire was installed around the perimter of the WMU. On May 29, 2007, an assessment of the southeast corner of the smelter. The target contaminants of the assessment are radioisotopes (thorim series and the radium series) and heavy metals. The objective of the assessment is to define the horizontal and vertical extent of target contaminant concentration. The contamination was originally discovered during the assessment of the scrap metal for residual radioactive material contamination. In addition, a former employee told the OSC material was buried in that location. The assessment consists of the surface and subsurface gamma radiation survey, collection of surface and subsurface soilds and soil samples and collection of groundwater samples. The subsurface samples were collected using a Geoprobe with a MacroCore. Temporary groundwater wells were installed to for groundwater collection. As of June 5, 2007, 11 sample holes and 3 background holes were installed with approximately 30 samples collected. All samples locations have a temporary well casing installed. Down-hole gamma radiation monitoring was conducted on each hole to delineate the vertical extent of the contamination down the casing. The holes are continuously sampled and an aliquot is taken from each core. Aliquots are also collected by the PRPs contractor as splits. Aliquots of all cores will be field screened for metals using the Niton XRF and run through the Smith Detection System HAZMAT ID to screen for other chemical contaminants. If other chemical contaminants are detected, those samples will be submitted for laboratory anaylysis. In September 2007, the site was listed on the NPL. As of March 23, 2008, Removal operations are complete.